Blasters and Holster sold separately. Body armour is only on the front, back is blue and grey polyester with fastening at the neck. The father of Boba Fett, who raised his son well and served along side Master Obi-Wan Kenobi. 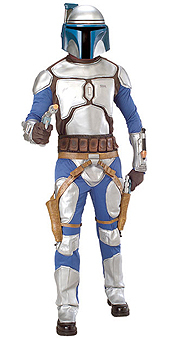 This Star wars Jango Fett Deluxe Adult Costume is high quality and super detailed. You have everything you need to protect the planet at arms reach when you wear this Jango Fett Costume.